As the competition is getting tougher and tougher in the retail environment, ambience has been taken as one of the important aspects to lure the shoppers. Today’s customers want a clean, well-lighted shopping atmosphere with merchandise clearly marked. From the moment the customer enters the store, the litmus test starts. Understanding the tactics of the business at each level, there are many leading retailers like Bata, Swarovski, Westside who have felt the need to redesign the format and give freshness to its final destination of sales. Highlighting and enhancing the existing architecture and character of the famous, heritage Army & Navy building, FITCH set out to modernise the Westside brand and the overall look and feel of the store in a way that would remain relevant for many years to come. The result matches the ambitions of Westside to be a truly international standard brand that engages the modern, discerning and demanding Indian consumer on many levels. The Kala Ghoda store is a flagship property for the brand, Westside. In terms of location, prestige, heritage and business importance, the store provided the best platform to showcase the all new Westside. Mr. Gaurav Mahajan- COO, Westside. “Keeping up with the tradition of innovation and perfection and in order to continue to show our strong will to further amplify the enchanting power of crystal, Swarovski decided to go for a make-over, “ says Sukanya Dutta Roy, Director-Consumer Goods Business, Swarovski India. 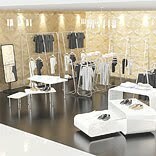 Freshness and new look actually are the reasons retailers are going for redesigning of the stores. Swarovski started its pilot phase of the Crystal Forest Concept in 2008-2009, where they implemented a limited number of pilot POPs. At present, they are introducing the new Crystal Forest shop fit in selected new locations, as well as start the step by step upgrade of our existing distribution with this new exciting retail design. The conversion program first focused on selected key markets and will stretch over the next years to all our monobrand distribution. When a company decides to go for make over, it takes lots energy and strategic planning to bring change in the whole format look. Dutta opines--As one of largest retailers in our industry we just have to accept certain realities. Most of the large retail chains have at least three different generations of architecture out there in the market at one given point in time. There is no other way to make a changeover feasible. Consumers do understand that for such a huge undertaking a transition period is necessary. To us, it is important to keep our service to the consumer at highest possible level in each boutique, regardless the color of its current architecture. The concept embraces a ‘Crystal Forest’ theme, highlighting the infinite possibilities of crystal and illustrates the company’s deep affinity with nature. Outside the boutique, the concept interprets the ‘Crystal Forest’ using a myriad of stainless steel prisms. This sparkling facade takes on the lights and reflections. The unfolding metal facets intrigue with their infinite depths and rich abundance. Fascinating displays are designed to create a connection with passers-by. Adding vibrant touches of colour, a seasonal visual conveys a strong fashion message and highlights trends and must-have products. Attractive display features create eye-catching scenes starring Swarovski jewels and decorative objects, whereas a crystal column brings an ultimate sparkle. The boutique, surface turns substance as the ‘Crystal Forest’ comes to life - all walls are textured with reflective white relief prisms of various lengths. The interior instantly embraces consumers with a crystalline feeling they will find in all newly fitted Swarovski boutiques. The atmosphere conveys a refined and poetic universe with recurring signature elements such as an impressive Crystal Swan behind the cash desk and Crystal Strand panels at the entrance. To complete this elegant interior, an exclusive lacquer developed for Swarovski adds a glowing sparkle to furniture, whereas the mirror finish is in stainless steel. Completing these striking elements, a modern art installation made of crystal, hangs from the ceiling embodying Swarovski’s creativity and sense of innovation. Lighting is a key feature of the new architecture. The ambient lighting creates a soft atmosphere within the boutique. In a captivating play of light and shade, the gleam from the LED illumination in the showcases hits figurines and jewellery from multiple / limitless angles causing the forest to be bathed in the infinite-light of crystal.